Last week, the Something Awful Goons exposed their beloved frog to a whole new audience. (For those who have requested a longer explanation of the frog's importance and origin, there's not much to it, really. He's a forums emoticon usually employed to tell substandard posters "get out." From where did he come? Not important.) Frog's adventures resume this week, and could probably continue in perpetuity, but other themes deserve space, too, so this is it. But if you still need more Frog after this installment ends, you can play HelixFox's Flash game! BARONS DEF CHARGER reveals the mind-controlling image he used to elicit such an overwhelming response. melaQuit sadly acknowledges that someone out there probably owns a bumper sticker of the Get Out Frog peeing. 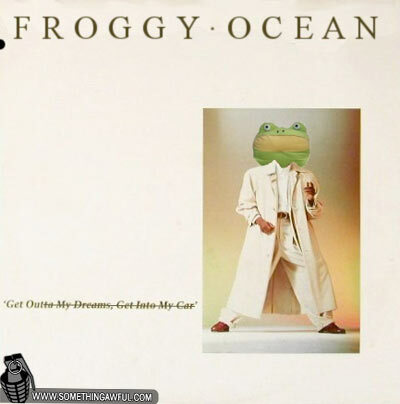 peepsalot notes that Froggy Ocean burst onto the scene with a cameo appearance in cousin Billy's "Loverboy" video. I worry about you, Rycro. Sometimes I worry a lot. El Hadji Diouf Kicks Back! Wake Up Your Dog: Photoshop Edition!